The French government, always keen to encourage local enterprise, showed an interest in the D.9 design and a sligtly larger aircraft, the D11 with two seats, followed. Joly and Delemontez fomally set up a company, combining their names. The Jodel company. The two seat D11 series was designed and constructed as a prototype batch for a French government requirement for an aero club trainer. 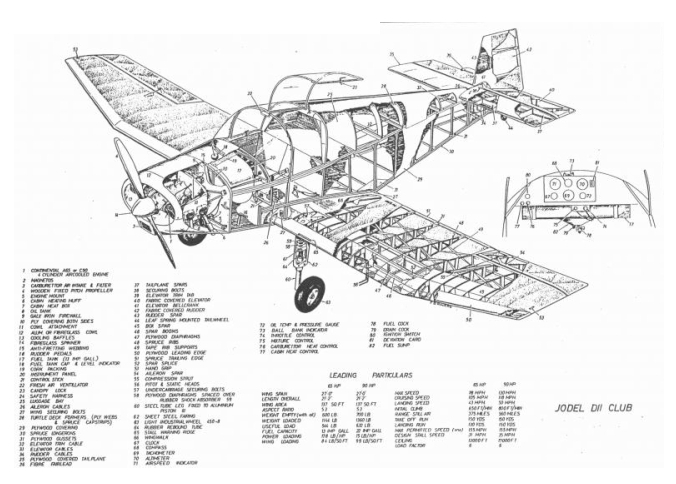 The Jodel Club is an enclosed, side by side, two seat dual control, low wing monoplane, which is essentially designed for the amateur builder and pilot, and first flown in 1951. Its essentially simple but rugged construction, together with the excellent flying qualities, have established the D11 as the most popular French two seater, and led to its adoption by many French flying clubs. The one piece cantilever wing has upswept tapered outer panels, typical of the Jodel types, with the inboard part of the wing straight. In other respects the con-struction is conventional and straightforward in spruce and plywood with fabric covering. The wing is built on a single box spar, which also supports the two legs of the wide track undercarriage. The undercarriage employs rubber in compression springing, and is fitted with light industrial wheels. The fuselage is a rectangular box structure with a curved spruce top decking and plywood covering. The tailpiece is also plywood covered, while the elevator and rudder are fabric covered. Longitudinal trim is obtained by an elevator trim tab. The design load factor is 6.0 at 1360 lb. The D11 may be powered hp Continental engines from 65 to 100 h.p. and seats two in side-by-side fashion. The Jodel company did not manufacture that many aircraft itself, their idea being to licence other firms. Jean Delemontez worked directly with two organisations in particular to develop the various Jodel models and series. The D11 variants, principally the 65 hp D112, the 90 hp D117 produced by Society Aeronautic Normande (SAN) at Bernay and the 90 hp D120 from Avions Wassmer at Issoire, were produced in large numbers for aeroclubs through the French government subsidy scheme. Wassmer started aircraft production at Issoire in 1945, building Jodel D.112 under license. There were versions that were called D119 and 1190. Founded 1958 by Mm d'Assche and Noin, Alpavia sa made the slightly modified Jodel D-117-A (two per month from January 1959). In 1962 partnership with Rene Fournier resulted in Avion-Planeur RF3 with Volkswagen engine. With SAN at Bernay Delemontez developed the 180 hp four to five seat D140 Mousquetaire and later the 100 hp two seat D150 Mascaret. New samples of the breed are still being developed, the D18 and D19 being the most recent models. Engine: Continental C90, 90 h.p. Wing Area: 137 sq. ft.
Wing Loading: 9.9 lb/sq. ft.
Engine: Continental O-200A, 100 hp. Endurance: 3 hr (aux. 4.5 hr). Useful load: 490 lbs (222 kg).